Naples is about so much more than pizza! It is a city of beautiful, vibrant contrasts, with restaurants full of a variety of tastes, textures, and cooking techniques. 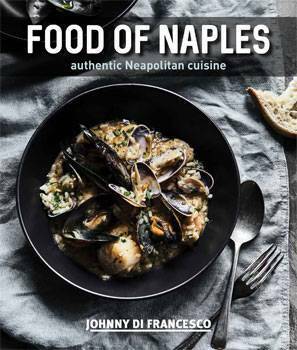 In Food of Naples"Authentic Neapolitan Cuisine, chef Johnny Di Francesco takes you on a personal journey deep into the heart of his childhood Naples and captures the amazing recipes of the city and surrounding areas. His beautifully photographed recipes and easy to follow instructions show you how to recreate the tastes and aromas of authentic Neapolitan cuisine. 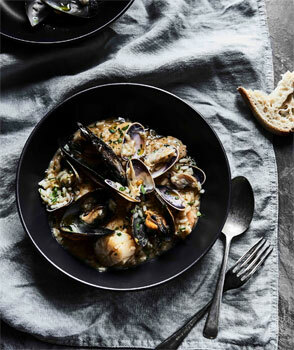 This cookbook contains a variety of dishes for lovers of Italian food"with tastes from the sea, and ingredients enhanced from the sun and soil. There's something for every taste; seafood, slow-cooked sauces, succulent meats, simple sweets, and an assortment of delicious pasta dishes. With this variety of recipes that contain a collaboration of authentic Italian flavours"Food of Naples includes simple and easy as well as some more challenging variations for the more experienced cook. To make the crab filling, combine all of the ingredients in a large bowl and mix together well. Transfer the mixture to a piping bag. Clean each zucchini flower and remove the internal stem. Once cleaned, pipe the mixture into each flower (about 45 g/1 ½ oz of filling). Close the top of the flower and set aside. To make the batter, add the soda water to a bowl and mix in the rice flour and plain flour. Heat the oil in a deep-fryer or large deep saucepan to 175°C (347°F). Dip each flower in the batter, one by one. 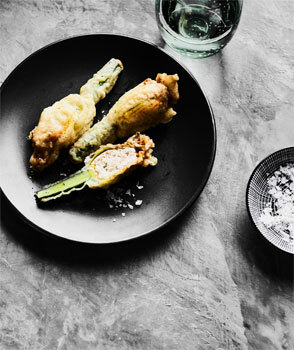 Carefully place each zucchini flower in the fryer. Fry in small batches until evenly golden, turning as needed. Drain on paper towels. Place the vongole in salted water for 1 hour to clean. To make the pescatore sauce, in a pan add the extra virgin olive oil, garlic and chilli. Cook until the garlic begins to brown, then add the prawns and scallops. Cook for approximately 2 minutes, then add the mussels and vongole. Add the basil. Cover with a lid to steam. Remove the lid and glaze with the white wine. Add fish stock and simmer for 3 minutes approximately, add a touch of Napoli sauce. Set aside until the rice is ready. To make the risotto, add the extra virgin olive oil to a small pot over medium heat. Sauté the diced onion until transparent. Add the Carnaroli rice and cook over low heat. Once the rice is toasted, add the white wine and wait until wine is fully evaporated. Once the wine has evaporated, add a third of the fish stock and stir until absorbed. Repeat this until all fish stock has been used. Add all the pescatore sauce and cook until a creamy consistency, add remaining fish stock and stir gently on a medium heat consistently. Once the stock has reduced to a creamy consistency take the pot off the heat and add the butter, parsley and stir fast until the butter dissolves. This will add to the creaminess of the risotto. Tips: Stir with a wooden spoon gently to avoid the rice from breaking. Add the butter. For best results, divide the recipe in two or four pans.